The final undertaking for our wintertime visit to Ireland was the chance at driving a car in the old country. For some driving a car on the opposite side of the road may be daunting, but we were up for the challenge. Actually, I should say Matt was up for the challenge. I was not about to learn how to drive a manual car in a matter of hours! Nevertheless, our journey on the Wild Atlantic Way was our chance to traverse the winding roads like locals. Having a car at our disposal meant paying a visit to the Cliffs of Moher in County Clare. The cliffs are about an hour and a half drive from Galway City. Adding this pit stop to the itinerary meant driving on the Wild Atlantic Way, a driving trail that ranges the west coast of Ireland for 2,500 km. Our west of Ireland adventure only brought us along 80 km of this roadway. We drove through The Burren, one of Ireland’s National Parks, on small coastal roads along Galway Bay. These roads were so small we had to pull over a few times so that large tour buses could make their way past us. What looked like a one-way road was indeed a two lane road, and definitely not a place you’d want to be driving in the dark! Leaving from Galway City Centre, the views on the Wild Atlantic Way were of a true Irish countryside. Rolling green hills of farmland separated by stone walls. Our road trip included a few games of spot the cow! Hailing from sunny California, the saying goes Happy Cows Are From California. Well sorry not sorry California, happy cows are from Ireland! Trying not to be distracted by all the cows, we also made sure to check out old castles, quaint little towns, and the beautiful landscape on the way to the Cliffs of Moher. Upon our arrival we made a quick stop at the visitor center to learn about the wildlife surrounding the cliffs and in the ocean below. 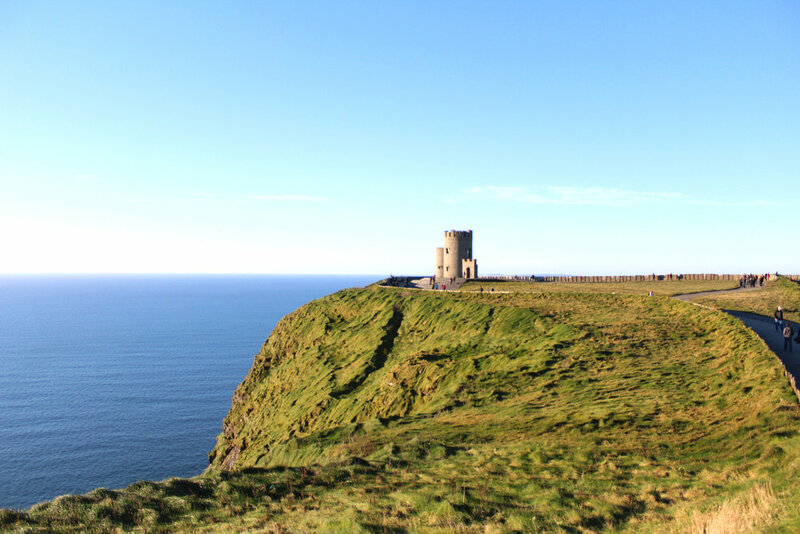 Then, we walked briskly to the cliffs edge and O’Brien’s Tower, a prime location for taking pictures. Here you can see the cliffs 200 meter drop to the ocean below. While we did have a beautiful clear and sunny day, it was still the end of November and the temperatures were in the 30’s. Cold noses and shivering like true LA folk in a cold climate, we grabbed coffees and enjoyed a peaceful walk at one of Ireland’s most stunning sites.